BRC Issue 8 Compliance is a hot topic now, so if you’re working with the BRC Issue 7 Standard for Food Safety, you will need to make sure that you comply to Issue 8 since it was released in August last year. We know there are a lot of sites out there, that need expert, practical guidance on how to manage the changes. In response to this, we have created our range of BRC Issue 8 training conversion courses that will teach you what you need to know and how to do it! This is NOT an official BRC approved course, but that’s why we think it’s the best out there! 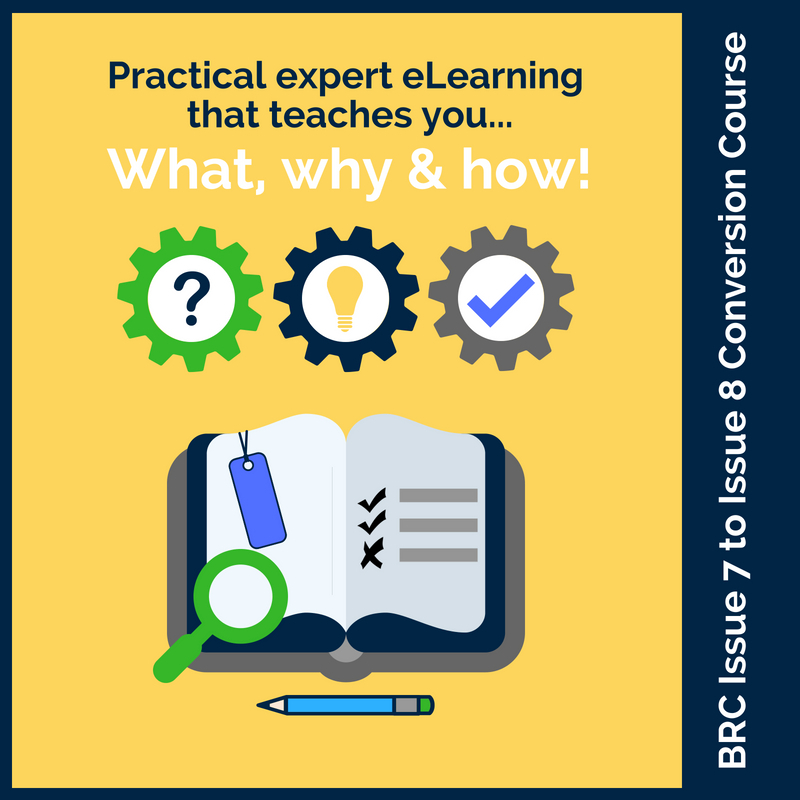 eLearning: This is the most readily accessible BRC Issue 8 training. It’s a cost-effective and flexible training option – at £195 & VAT per person it’s accessible after purchase on our learner dashboard which is cloud-based. You login and get working through it. You don’t have to do it all in one go and can come back to it as often as you need to, so its easy to fit it in with your busy schedule. When you’re finished, you take a multiple choice test and download your certificate. There’s a PDF lesson guide included on your dashboard too, that you can save or print out – whatever suits you. In-House Course: If you want to arrange for a teacher to deliver the BRC Issue 8 training course at your site, we can arrange this for you. We have put this option together for you, if you want to train a team of people who will be involved in the work you need to carry out to convert to Issue 8. This is classroom-based training for 1-day at a date to suit you, is priced at £1995 & VAT plus *trainer expenses. The advantage of this option is for sites who need to train more employees, as this course can accommodate up to 12 delegates of your choice. Our teacher will bring all of the course materials and lesson guides, you just need to provide the space. Which aspects of the course did you particularly find helpful or enjoyable? Which aspects of the course do you feel could be improved? 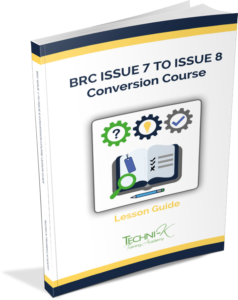 The BRC Issue 8 training conversion course has been designed by specialists in meeting the GFSI standards, including the BRC standard. We have used our expertise to develop a course which not only explains what the changes are. but also what they mean and more importantly – what you need to do to be able to comply. It provides practical guidance on the systems and procedures you will need to implement and the evidence you will need to demonstrate to your auditor. Each learner will receive a full colour, 160 page course lesson guide, worth £55 which covers all of the content from the course that will aid you in implementing the changes. 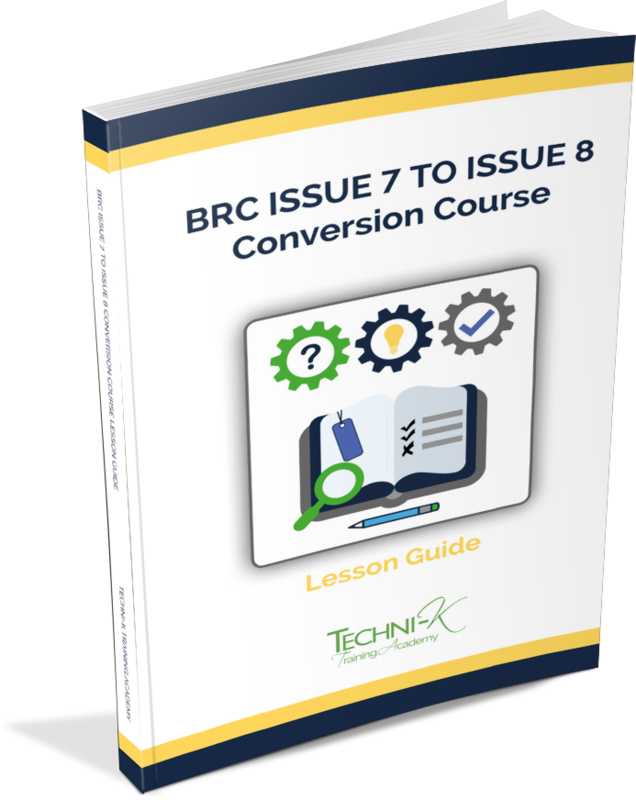 This BRC Issue 8 training compliance course has been designed by Techie’s for Techie’s. Whether you’re a site technical or quality manager, working in group compliance role or a consultant – this course is for you! At the end of the course, there will be a short multiple choice test of 25 questions. A 70% pass rate will be required to receive a certificate.